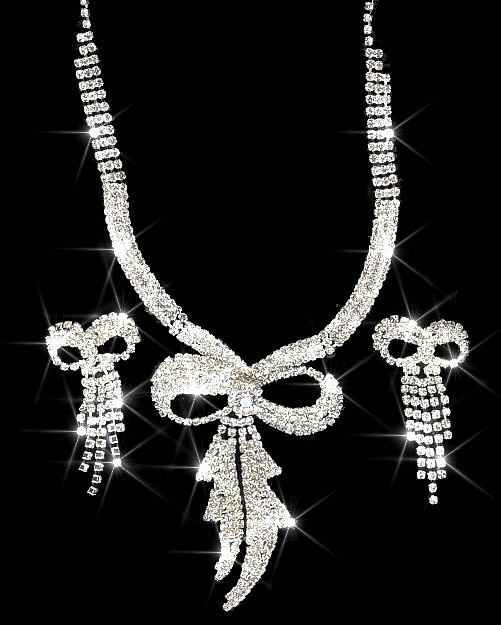 This exquisite necklace and matching earrings look as if they stepped off the set of a scene in Breakfast at Tiffany's" or "High Society" Pure glamour and sophistication and wonderfully timeless and classical, this is exactly the look you'd get if you could tie a free-flowing bow in a length of dazzling diamante. One thing you can be sure, whether it's destined for prom, wedding, night out, candlelit dinner or barbecue - you're guaranteed to be the belle de jour! Necklace: 37cm - 46cm (14½"-18") Bow Drop section: 6.5cm (2½"). Earrings Drop: 4cm.